The PG56-XLR includes a 15ft (4.57m) XLR to XLR Cable, A50D Drum Mic Clamp, Integrated Stand Mount, 5/8" to 3/8" Thread Adapter, and a Storage Bag. 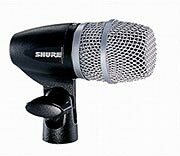 The PG56-LC includes an A50D Drum Mic Clamp, Integrated Stand Mount, 5/8" to 3/8" Thread Adapter and a Storage Bag. Includes 15ft (4.57m) cable, A50D drum mount and storage bag.